The other day I was sitting on a plane from Warsaw to Barcelona. With me, my friend, speaker and trainer Florian Mueck. We were coming back from a spectacular Spectacular Speaking event. In her opening speech, the incomparable Olivia Schofield, founder of the Spectacular Speaking series, said: The one thing that takes you from great to spectacular is… connection. Connection. Connection between the speaker and the audience. Connection between oneself and the other. In the end, we knew that we wanted to show two dimensions – the self-focus (or speaker focus) and the other-focus (or audience focus). Self/other-focus refers to the degree with which one chooses to be concerned with oneself and with others. We also knew that we wanted to use the high-low categories. Our big challenge – the four field titles. After three hours we finally felt confident about the names. “The Connection Matrix” was born. The Connection Matrix shows four different kinds of speakers/communicators. In this first part we’ll look at the status quo of their communication mode. Low empathy combined with low self-interest. Numbers drive through life with their handbrake on. They’re the typical business presenters. Not passionate about the data they present, numbers deliver only to deliver. Their voice? Monotonous. Their body language? Closed. Their enthusiasm? Not existent. They say: But how can I put passion into my monthly business unit report? Numbers never consider a speech or presentation an opportunity. For them, communication is an obligation. Creativity is for artists, they think. They also think: I do my job. Isn’t that enough? If others don’t like what I say, it’s not my fault. Numbers are brilliant at avoiding responsibility – for themselves and the audience. Like Florian’s mom says: Where there’s no hook, you cannot hang a jacket. The paradox with numbers is that they don’t count: no one listens, no one remembers, no one cares. Connecting as number, you fail to connect. Number-mode is beneficial only when you wish not to connect. Numbers are the poorest connectors of the four types. High empathy combined with low self-interest. Nurses strive to please their audience. They communicate with the language of “you” and their goal is to promote the audience. A nurse’s communication style consists of satisfying the interests of others. The paradox with nurses is that by failing to affirm their self-interests, the connection entails no expense and so is undervalued. Because nurses don’t speak up for themselves, audiences don’t really listen, care less and very easily forget. Connecting as a nurse, you don’t make an impact. Nurse-mode is beneficial when you wish to go unnoticed. If you don’t shift to buddy, your audience will soon take you for granted! Low empathy combined with high self-interest. Bullies strive to satisfy their own interests. Bullies communicate with the language of “I” and their style consists of pushing an agenda. In bully-mode, you believe only you hold the power to make a change. So you feel you have little to learn from your audience. A bully’s preferred strategy is Follow me, now! The paradox with bullies is that in failing to give the recognition they seek, they struggle all the more to get it from their audience. People listen, they remember, oh! but they don’t care. Connecting as a bully, you fail to inspire trust. Bully-mode is beneficial when all you want is to stand out from the crowd. If you don’t shift to buddy, your audience will begin to feel betrayed and soon you’ll end up talking to yourself! High empathy combined with high self-interest. Buddies strive to develop a whole that is greater than the sum of its parts. Buddies communicate with the language of “we” and their style consists of promoting ways to satisfy self-interests and the interests of others. In buddy-mode, you believe in a joint potential and so the purpose of communicating is mutual growth. The preferred strategy is How shall we do this? You know you’re listening to a buddy when you’re pushed out of your comfort zone and it feels good! The paradox with buddy-mode is that when you place the connection at the center, the result is the speaker meets her goals and the audience gets what they came for. Everyone is happy. Audiences remember buddies, they listen to them, and they definitely care. Connecting as a buddy, you act like a magnet, attracting others to move out their communication mode and to connect as buddies. Buddy is the ultimate mode of connection because everyone grows beyond expectation. 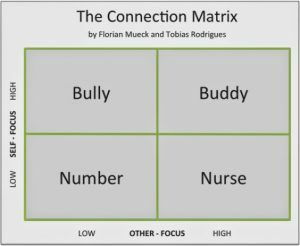 Whether you consider yourself a Number, a Nurse or a Bully, in The Connection Matrix – Part Two we’ll share with you insights on how to become a Buddy, the ultimate connector.